By accident, I came across this piece that I had tucked away several years ago. I don’t know who wrote it or how true it is, but it certainly makes for fascinating reading! Worse yet were the really poor folk who couldn’t even afford to buy a pot. They “didn’t have a pot to piss in” and were the lowest of the low. June Weddings: Most people got married in June because they took their yearly bath in May, and they still smelled pretty good by June. However, since they were starting to smell, brides carried a bouquet of flowers to hide the body odor. Hence the custom today of carrying a bouquet when getting married. Family Baths: Family baths began with one big tub filled with hot water. The man of the house had the privilege of bathing first, in nice clean water. Then, one by one, all the other sons and men took their baths in this same water, followed by the women, and finally the children – last of all, the babies. The Canopy Bed: There was also nothing to prevent creatures from falling right into the house. This posed a real problem in the bedroom, where bugs and other droppings could mess up your nice clean bed. Hence, a bed with big posts and a sheet hung over the top afforded some protection. That’s how canopy beds came into existence. 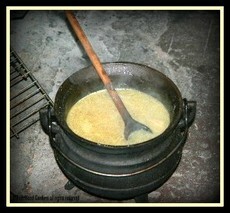 Pease Porridge: In those old days, they cooked in the kitchen with a big kettle that always hung over the fire. Every day they lit the fire and added things to the pot. They ate mostly vegetables and didn’t often have meat, so peas were a staple. Poison Tomatoes: Those with money had plates made of pewter. Food with high acid content caused some of the lead to leach onto the food, causing death from lead poisoning. This happened most often with tomatoes; so for the next 400 years or so, tomatoes were considered poisonous. Bread: Bread was divided according to status. Workers got the burnt bottom of the loaf, the family got the middle, and guests got the top layer, the upper crust. Saved by the Bell: England is old and small, and the local folks started running out of places to bury people. So they would dig up coffins, take the bones to a bone-house, and reuse the grave. However, when they reopened these old coffins, they found that 1 out of 25 coffins had scratch marks on the inside; and they began to realize that they had been burying people who were still alive. P.S. If anyone knows who I can attribute this to, please let me know and I’ll post it! I was in a house with a dirt floor one time, never forgot it. I remembered when I was there that had the thought that the family truly was “dirt poor”. Shared this with my 9-yr-old to explain the nursery rhyme. All so interesting! When we visited Scotland years ago, I visited a historical sod hut on the Isle of Skye. It was hard to imagine anyone living in that tiny, dark space. Dirt poor is right!